We're going to wrap up here for the night. Read our match report of Man City's win here. And remind yourself of Arsenal's win over West Ham earlier on thisaway. Den: Man City celebrating like they’ve won Europe when they’ve won a reserve game is a bit embarrassing. Dyednooh10: Manchester City B team beats Leicester City A Team. This shows the gulf between Manchester City and every other teams in English Football at the moment! Manchester City boss Pep Guardiola to Sky Sports: "I'm so happy. A lot of young players played. I'm so happy for all the players. "The way we had to react was not easy, we were tired, we had a lot of young players, Danilo was playing at centre-back for the first time in his life. It’s not easy because Jamie Vardy and Riyad Mahrez were there. "What I liked the most is how we reacted and overcame that situation. It’s a good indication for the future. "They showed me very good things. How you react is important and there were no complaints from the players in extra time about how it was unfair that they had scored a late goal." "Forget about it. That is not going to happen." Leicester manager Claude Puel to Sky Sports: "We were unlucky. We have had most chances. It was a fantastic game between two good teams. "We gave our best. It was important to give a good response after the last league game. I like our positive outlook. “It was a good moment for Jamie to come into the game. It was a good thing for him to score tonight. No regret about tonight. We were unlucky with a lot of chances." Ten years from now, robots will rule the earth. But people will still be making jokes on Twitter about ABBA penalties. Manchester City's Oleksandr Zinchenko to Sky Sports: "I was supposed to be the fifth penalty taker, I'm happy because Claudio Bravo is the hero again. Many congratulations to him and the team. "It was an amazingly difficult game. Leicester were champions two years ago. "This was an important win for us. We have to keep going and play the same way. We played not bad until the penalty and controlled the game until the last moment." Manchester City goalscorer Bernardo Silva to Sky Sports: "It was a difficult game for us. We were controlling the game until the late penalty. "Leicester have a very good team. Fortunately Claudio Bravo in the end gave us the win again. "It's been a great start of the season. I hope we can keep winning games, because this team deserve to keep winning because of the way we play. We will try to celebrate something at the end of this season." West Ham manager David Moyes to BBC Radio 5 live: "Our performance was honest. What we lacked was quality. "We played Arsenal over two games and we conceded one goal and it wasn’t an Arsenal-type goal. The goal could have been better, but the players worked hard in both games. We didn’t play well enough but we were never out of the game." Well done to the Manchester City boys. You need to hold your nerve in the shootout. It's ironic, Jamie Vardy and Riyad Mahrez missing their penalties. It is always a shame when it goes this far and you are close, but City hung in there and came through it. Jake Saunders: Let's address the elephant in the room; this new penalty shootout system is utterly stupid. 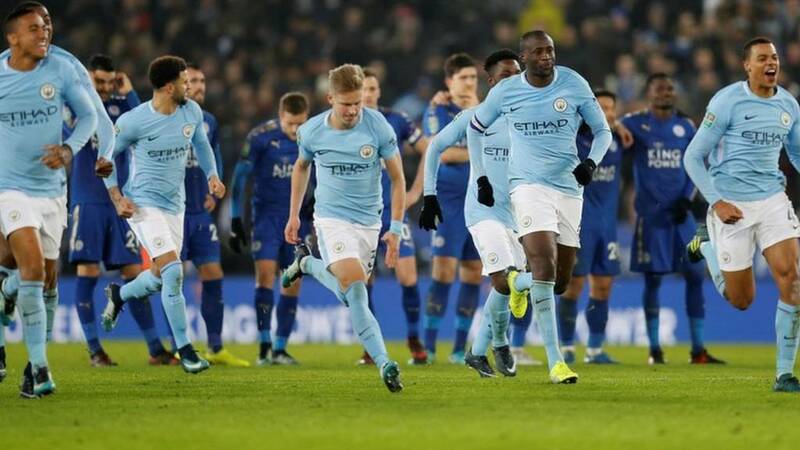 Manchester City have made the League Cup semi-final for the third time in the last five seasons. They're not doing it the easy way this year though - they have needed penalties to beat Wolves and Leicester now. Those are two of the only four games City have failed to win (in 90 minutes) this season. Pep Guardiola comes onto the pitch to dish out hugs and high fives. And he's revving up the away fans like a conductor. Now he's chatting to Oleksandr Zinchenko, who could be a Kevin de Bruyne lookalike. So Leicester's big two stars were the only players to miss their penalties in the shootout. Claudio Bravo is a penalty shootout hero again. Claudio Bravo saves! And it's all over. Flicks the post and goes wide. Bravo had dived the right way. Bottom corner. Keeper goes the wrong way.